Aries rising is both positive and dynamic. It endows you with a go-getting, achievement-oriented personality, for you like to be in charge and want to make a big impression under all circumstances. Dedicated to satisfying personal ambitions and pursuing your own ends with complete disregard for the feelings of others doesn't necessarily mean you are always selfish, my dear, but in your haste and eagerness to reach that goal or accomplish that oh so important purpose, it is so easy for you to forget other people's needs, or that what you do may react adversely on others. 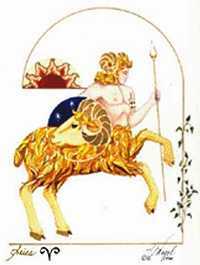 A powerful inner drive and a strong need for accomplishment, combined with your indomitable Aries courage, urges you to go for things others might think are too risky, too foolish, or just too much work. Enthusiastic Aries has loads of energy. Once inspired, you rarely hesitate to act and you usually get where you want to go. But be warned! Your lively enthusiasm can get out of hand; you tend to overestimate your own abilities, or the influence you have. In general you maintain an informal approach to life, with easy, open mannerisms and an attitude of "take me as I am". Confronting situations openly and with force need not necessarily brand you as unduly aggressive, for you can be quiet and hard-working, sublimating your energy inconspicuously in low-key activities. However your innate restlessness makes it difficult for you to develop an extended concentration span, control your untidiness, or get truly focused and organised. You have mechanical abilities or cleverness in one form or another. Fevers, eye strain, accidental injury to the head, skin rashes, overwork, migraine headaches, and insect bites are your most likely physical complaints. Your extremism leads to mental and emotional instability in some situations and you get distinctly stressed out by being thwarted in the pursuit of your goals.